Over the last month, the discussion has heated up about Asian carp and the Chicago River shipping canals that connect the Mississippi River watershed to the Great Lakes. The fish are currently widespread throughout the Mississippi River watershed. It is feared that this group of invasive carp species (including bighead and silver carp) will find a way past an electric barrier on the Chicago River, invade the Great Lakes, and cause widespread ecological and commercial disruption to the Great Lakes ecosystem. In November and again in December, Asian carp DNA (though not actual fish) has been found in fish samples taken past the electric barrier, only miles from Lake Michigan. The video clip below clearly shows why Great Lake residents should be concerned. In December, Michigan Attorney General Michael Cox sued the State of Illinois and the U.S. Army Corps of Engineers to force the closure of the locks on the shipping canal. Michigan was soon joined by the other Great Lake States and the province of Ontario. The Obama administration and the State of Illinois opposed the suit, as the closure of the locks would hamper commercial shipping and cause possible flooding problems. 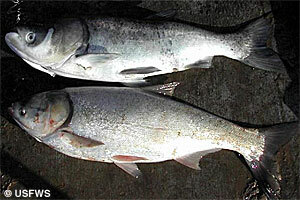 It is likely that the Asian carp would eventually spread to the Huron River if the fish are able to enter the Great Lakes. Michigan citizens are welcome to learn more and to sign a petition at this website created by Attorney General Michael Cox: www.StopAsianCarp.com. On January 15, the U.S. Supreme Court met in a closed conference to discuss the issue, and on January 19 decided not to force the U.S. Army Corps of Engineers to close the two locks. The court issued its announcement with no explanation. Later in the day on January 19, the U.S. Army Corps of Engineers announced that Asian carp DNA (though not actual fish) had been found in Lake Michigan proper. On January 20, Michigan U.S. Representative Dave Camp introducted the Close All Routes and Prevent Asian Carp Today (CARP ACT), which if passed would direct the Army Corps to close the locks and also calls for additional barriers to be erected to prevent the carp’s spread.